Dainty border of pink Peonies; 17 watercolor elements included. Are you working on a design that requires delicate, peachy-toned flowers? Does your wedding or other occasion have a spring or country theme? Then this pre-made watercolor clip art floral border in blush-colored Peonies is just what you need! The listing includes the 17 individual watercolor elements used in the border. Ideal for wedding stationery or to embellish your blogs and scrapbooks! Put together wedding and other designs in minutes with the border. The border measures 12 inches X 6 inches (3600 X 1800 pixels). For example, single flowers measure 3.3 inches X 3.1 inches. Floral clusters measure 6.2 inches X 2.6 inches. Branches measure 2.5 inches X 4.0 inches. 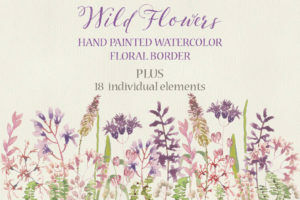 1 zipped folder is immediately available for download following purchase, containing the watercolor border (JPEG and PNG – 2 files) and the individual watercolor elements (PNG – 17 files). 19 files in total.